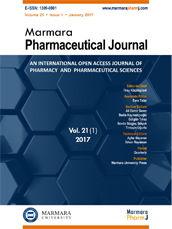 1Department of Pharmaceutical Botany, Faculty of Pharmacy, Marmara University, İstanbul, Turkey DOI : 10.12991/mpj.201519392830 A comprehensive ethnobotanical study has been conducted in Bayramic in the western part of Turkey. This paper includes folk medicinal plants and ethnopharmacological information obtained during this ethnobotanical study. The aim of this study is to collect and identify the plants used by the local people for therapeutic purposes and to reveal information about traditional herbal medicine. The materials of this study are the plant specimens collected during the fieldwork. The information was obtained through open and semi-structured interviews from the local people. In addition, cultural importance index (CI), medicinal importance index (MI) and use report (UR) were calculated. Eighty-nine folk medicinal plants belonging to 39 families were identified in this study. Among them, 71 species are wild, and 18 species are cultivated plants. The most common families are Lamiaceae (25%), Rosaceae (9.1%) and Asteraceae (9.1%). Consequently, 192 medicinal uses (remedies) belonging to 89 taxa were recorded. According to the use reports (UR), the most important medicinal plants were Allium sativum (92 UR), Lavandula stoechas subsp. stoechas (89 UR), Vitex agnus-castus (89 UR), Pinus brutia (87 UR), Olea europaea subsp. europaea (83 UR), Sideritis trojana (83 UR) and Cydonia oblonga (80 UR). Infusion (53.4%) is the most common preparation method in the research area. Traditional folk remedies are still important and used in therapy, especially in the villages in mountainous areas. Keywords : Ethnobotany; Folk medicinal plants; Bayramic; Çanakkale; Turkey.